Misc. materials and Coreopsis, a Virginia Sarsfield paper whose color and texture motivated it all. Cover: South Pacific fabrics, copper lamè, crepe satin. Hearts: tigerstone with threads, bells, beads, metallic circlets from dream catchers. Soft cover: felt and Tyvek. Wrap-around cover mirrors sanctuary doors. Text: Wausau Royal Fibre Cream Wausau, Neenah's Brushed Khaki. Poem typeset in Freehand 575 and painted with Inkadinkadoo and glitters. Beach has Prism iridescent and sand from our favorite beach. Stars: Lisa Frank. Rubber stamps: Inkadinkadoo. 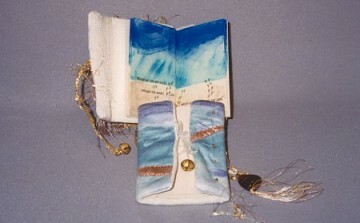 Book 3″ x 4″ (7.6cm x 10.2cm). E-mail Barbi Striar Disraely or visit her website. See her artist book in Pauline Sager's First Book Swap.